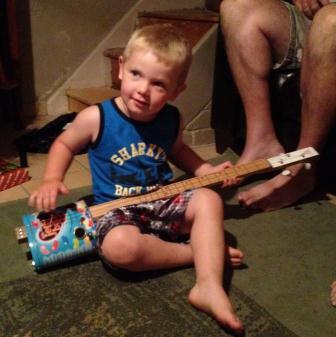 Here is our latest Cigar Box Guitar owner ! The proud custodian of the (now famous) Jelly Babe CBG. How cute!! looks like a fun instrument! Go forth into the world young man and make wonderful music. With the blessings of Devil Guitars Tasmania. We'll book you in for a pick up update when you are ready. GaGa holds the power....one Pignose amp. We bestowe upon you the position of Permanent custodian of the famous Jelly Babe. Go forth into the world and make wonderful music. With blessings from Devil Guitars Tasmania.